බය වෙන්නෙපා මාතෘකාව දැක්කම. 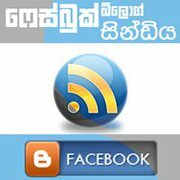 කාරුණික ඉල්ලීමක් කරන්නයි හදන්නෙ. Don’t be amazed seeing the title. Going to do a kind request. UCSC 1st Year අපි, 2010 මාර්තු 28 ‍වෙනිදා පිරිත් පිංකමක් කරන්නයි සූදානම. ඉතින් ඒක‍ට ආධාර එකතු කරගන්න අපි ස්ටිකර් කිහිපයක් ගහල තියෙනවා. හෙ‍‍‍ට හා අනිද්දා ( 06, 07) ලංකාවෙ නගර කිහිපයකදිම මේවා අලෙවි කරන්න සුදානම් කරලා තියෙනවා. අපි හෙට ගම්පහ පැත්තෙත් එනවා. මේ සද් කාර්යයට ඔබ සියලු ‍දෙනා දායක වෙන්න. We, as UCSC 1st Year students, are organizing a Pirith Ceremony.This is an annual function in UCSC. This time it is planned to hold on 28th March. So we have decided to sell stickers to collect funds for this. Stickers will be sold in major towns in Sri Lanka on 7th and 8th March. We’ll be at Gampaha tomorrow. So invite you all to please join this meritorious deed. I’ll add more info soon.